A really tasty cut of pork, which when roasted gently for a long time produces moist, succulent meat that will melt in the mouth. Preheat the oven to 150°C, gas mark 2. In a large bowl, mix together the fennel seeds, juniper berries, rosemary, lemon zest and garlic until combined. Stir in the olive oil and lemon juice to form a paste. Untie the pork and roll it out with the skin side uppermost (the skin is already scored). Using a really sharp knife, carefully slice under the skin, leaving one end still attached to form a flap; this gives you an extra layer for the herbs. Season the meat with freshly ground black pepper, then spread the herb mixture under the flap, into the meat and onto the sides. 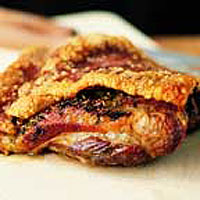 Pat the skin back down, then place the pork skin-side up in a shallow roasting tin. Rub the rind with the vegetable oil and sprinkle with sea salt. Roast for 1 hour, then pour in the wine, and continue to cook for a further 2-21/2 hours, until the pork is thoroughly cooked, there is no pink meat and the juices run clear. If the skin isn't at crackling point, cut it off and place it under a hot grill for a few minutes before serving. Cover the meat with foil and allow the pork to rest in a warm place for 10-15 minutes. Serve with roast potatoes and some lightly cooked savoy cabbage, accompanied with Waitrose Bramley Apple Sauce.